xplorer2 v 2.0 (Windows) - Powerhouse Explorer replacement evolves ~ Android Forever! Start with a speck of sand, and continue adding grains one by one. When does it become a pile? When does it become a mountain? 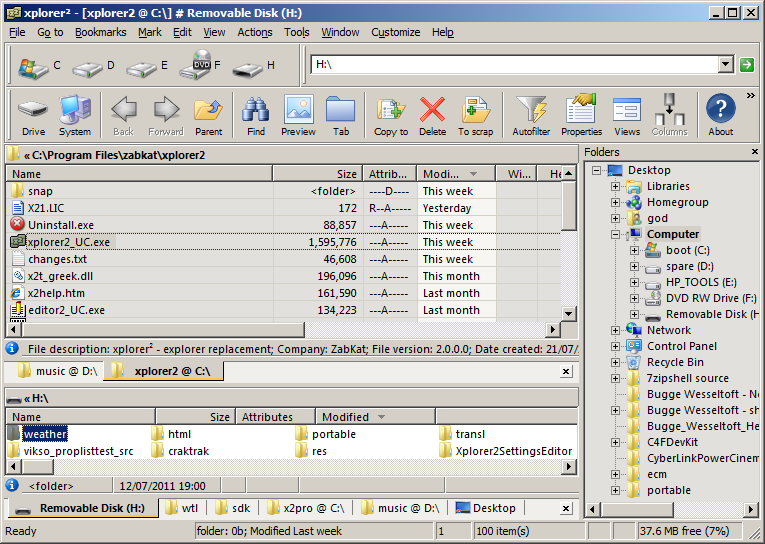 xplorer² lived in "version 1.x" guise since its inception 7 years ago, continuously growing in features. Well it is time we called it version 2.0 after some substantial new features were added recently. The most obvious addition is the dockable/floating panes. You are no longer bound to keep the tree on the left. You can drag it from its titlebar and drop it to any of the 4 corners of xplorer² window. Likewise for all other auxiliary panes (quickviewer, miniscrap, etc). You can even have such panes floating (detached) if you press <CTRL> key while dragging them by the titlebar. You also get large toolbar and drivebar icons (see snapshot). If you like your images large then just get one of the new XL skins and right click on a toolbar to select the large icons from the context menu.